After a winter of limited fresh fruits and vegetables, spring arrives and the Farmer’s Market baskets are full of bright green, yellow, and red delights. I walk past the booths, relishing the sights and smells of the tempting produce, the smiles on everyone’s faces. My mind fills with ideas of what I want to make and as usual, I buy too much. I just can’t resist when everything is so fresh. Our farmer’s market always has the same vendor in the first booth. He sells the biggest, most fragrant strawberries. The air is permeated with their sweet aroma, begging you to take them home. You can’t walk by without buying some. His booth always has the longest line and it doesn’t slow down until he runs out. My favorite strawberry dessert is shortcake. I wait all year for it. The best I ever had was from a place called the Nut Tree in Fairfield, CA. They made it with a crisp sugar cookie topped with a scoop of vanilla ice cream, sugared strawberries poured over the top. Another cookie and some whipped cream finished it off. It was a huge portion and I always ate every bite. I couldn’t get enough! These days I prefer a more traditional version. Instead of the sponge cakes they sell as shortcake in the grocery stores, I like a biscuit similar to a scone. Tender, with a hint of lemon, it is the perfect foil for fresh strawberries and whipped cream. Even if you are leery of baking, if you follow the direction these are really easy to make. Even novice bakers will have success! For the Berries: Remove the stems and cut in half lengthwise (quarter large berries). Place in a medium bowl and sprinkle with the sugars and vanilla. Toss until evenly coated, cover, and place in the refrigerator. Preheat oven to 400°F. Line a baking sheet with parchment. For the Biscuits: Place dry ingredients in the bowl of a food processor. Pulse a few times to blend. Add half the butter and pulse to cut it into the dry ingredients. It will look crumbly. Add remaining butter and pulse three times. The butter will still be in fairly big pieces. Combine the egg with lightly whipped cream and lemon zest. Add to food processor and process just until the dough comes together and starts to form a ball or clings to the sides of the bowl. Transfer to a floured board and gently press together. Pat into a rectangle. Cut into squares and then diagonally into triangles. Transfer to prepared baking sheet. Brush tops with melted butter and sprinkle with Turbinado sugar. Reduce oven temperature to 375°F and bake for about 20 minutes or until golden brown. Cool on a wire rack. For the Topping: Whip the cream until slightly thickened. Add the sugar and vanilla. Continue whipping until soft peaks form. To Serve: Split biscuits in half horizontally. Place bottom halves on serving plates. Top with some strawberries and their juice. 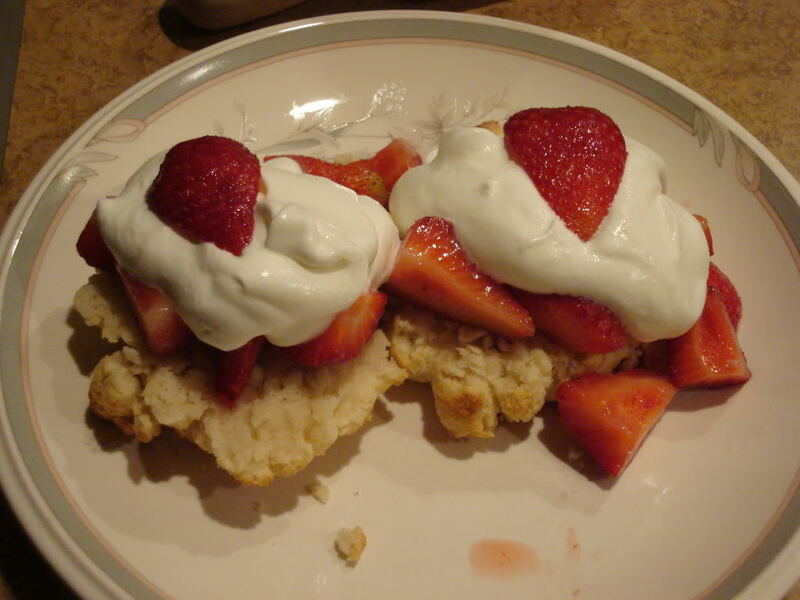 Place the top of the biscuit at an angle, top with a dollop of whipped cream and serve. By © 2010 Jane Bonacci, The Heritage Cook. All rights reserved.